2xCS uk 1987 Factory FACT 200C Original boxed-cassette format with unique packaging deleted. Also released in 2 standard forms; blue+red sides, black sides. The first pressing may have Murder on tape 1. 2xCS ca 1987 PolyGram 832 617-4 Cassette #2 "Substance Sides"
Received a gold disc award from the RIAA (USA) on February 17th 1988. Received a platinum disc award from the RIAA (USA) on January 18, 1991. "Not for resale unless desperate", the footnote on the cover says it all. Fact 200,number 189 of a limited edition of 1000.This version of the album was only given to friends and family of the band. 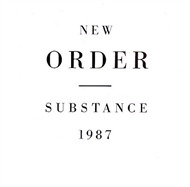 The front cover reads "I used to think the day would never come" The gatefold substance-New Order-Limited Edition of 1,000 copies. And the reverse, Fact 200. Album One-Conch Shell Red. Album Two-Peony blue.Not for resale unless desperate.